December | 2018 | hear.here. I came across an audition notice today for “Clue: The Musical” and for a fleeting moment thought I should audition. Every time I hear about this show, my heart drops a little bit and I feel the sadness of my loss all over again. For many people who are hard-of-hearing, the words “hearing loss” are not used. For me, it is very much a part of me – it was a very big loss in my life that caused depression and PTSD. I don’t believe I would be close to where I am today if I hadn’t fully embraced, grieved, and dealt with that loss. So yes, I am perfectly okay with identifying as a person with hearing loss. In August of 2001, I was having a great year. I’d just gone on my first big work trip (to Semiahmoo, Washington), and was super healthy. I’d started working with Teresa, who would be my personal trainer for the next 6 years, and was in the best shape of my life – my Crohn’s was in remission and had been for several years. I was happy in my long-term partnership and had two great stepkids. I’d bought my first car and was financially in a great place. That spring, I’d performed in a little known but fabulous musical called “Personals”, which up to that point had been both my biggest role and my favorite experience doing theatre. I was 25 years old and finally feeling like I had my life together and was a real adult. 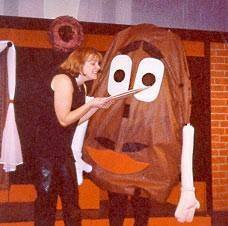 My big solo in “Personals” involved, ironically, screaming into Mr. Potatohead’s ears about listening. Anyone who does theatre knows that each show you do is special and unique, but some stick with you more than others – either because of the cast or the director or the show itself. “Personals” was special because of all of those things. We were truly an ensemble – there were 6 of us in the cast, each with pretty equal parts. I personally played about 10 different characters in that show, and I loved every single minute of it. Every night up on that stage with my friends, I felt like I belonged – that this is what I was meant to do. There were some challenging moments, as someone with single-sided deafness, but somehow it was still easy and perfect. I took that momentum and ran with it. Only a week or so after I returned from my work trip, I auditioned for a show with the same director at the same company. It was “Clue: The Musical”. While I didn’t (and still don’t) love the idea of any improv or audience participation, I did love the idea of playing Miss Scarlet. Let’s face it – 25 year old redhead me was basically the physical embodiment of what that character should be. I walked into that audition confident, with my head held high, and looking great in my favorite dress. There was no choice. I sang “Someone Else’s Story” from Chess, which to this day is still one of my favorite songs to sing, and I absolutely nailed it. I remember it like yesterday, it was easily the best audition I’ve ever had in my life – then or now. Of course I got the part. I went to bed feeling great about myself … and woke up deaf the next morning. From that day on, the Ali that nailed that audition ceased to exist. I’ve told the story from there many times in many places, so I’m not going to get into that again here. Instead, I want to focus on that grief, the feeling that my life as I knew it was over. The loss that meant my dreams of being a musical theatre performer, either professional or for fun, was never going to happen. Post-traumatic stress disorder is something extremely real. I didn’t put those words to my experience until several years later, when my therapist, Susan, named it for me. All I saw was anger, sadness, guilt. Then there was the denial, “It will be fine. Everything will be fine. Just keep doing what you’re doing.” But it wasn’t fine. It was nowhere near fine. Over the next year, even after my hearing aid, I felt like I’d lost everything. Completely subconsciously, I retreated from life – my behavior and mindset became that of a damaged child (which was an easy trap for me to fall into, since I spent the majority of age 12-18 there). I dropped my employment down to the minimum number of hours I could do to still keep benefits. I picked fights with my partner, I was a horrible stepparent, I completely alienated a couple of very close friends and pulled completely away from most of the others. I didn’t go to shows or concerts. The idea was I was going to focus on writing a musical and that was going to be my creative outlet. If I couldn’t sing, I could still make music. I had the first act fleshed out and a lot of music actually written back from a class I took in undergrad. But you know what is needed to write music? Musical skill, theory, and training. The ability to hear doesn’t hurt either. I’d written some songs before – very basic because I was dependent on my meager piano playing ability – and I’d written them by ear. By listening and putting things together that just seemed to flow well when I was playing them. I knew what chords sounded good. But it had been since high school – 6 years prior – when I had last really done that. What was supposed to be an escape, a release, just became another giant frustration and I went spiraling down. Eventually I hit rock bottom. Instead of leaving me out in the cold like he easily could have, Barry took me to his therapist. And I will be forever grateful for that. I found Susan and started the work of climbing back. She and Barry both helped get me to the point where I felt like I’d give auditioning a try again. I found Phamaly and never looked back. I finally knew I’d really be okay. Years of Cognitive Behavior Therapy, successful (and unsuccessful) auditions, support from my family, phamaly, and friends, and I started really being okay. My life started to have focus again, and I was surprised that it was away from musical theatre where I really found myself, became an “adult” again and was able to make real choices about where and who I wanted to be. In “Clue”, the song “Everyday devices” refers to the wrench, candlestick, rope, etc. Things that are around in everyday life. For someone with mental or physical illnesses, we having coping devices – or physical devices such as a cochlear implant – that help us get through everyday life. Cognitive Behavior Therapy is all about identifying what things trigger what feelings in you and changing the way you react to those triggers. So today, when I saw that audition notice for “Clue”, I recognized that it triggered sadness in me. I let myself feel that sadness for a bit and then changed my reaction to an odd feeling of nostalgia and came to write this – a validation to myself that while I am not the musical theatre star I once wanted to be, that’s okay. Feelings change, people change, and it doesn’t make you a failure or a bad person, it makes you human.